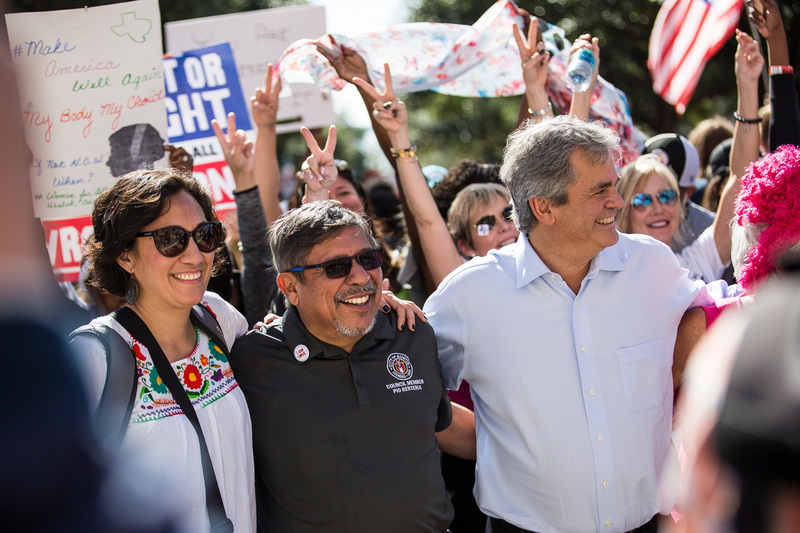 Austin City Council member Delia Garza attended the Women's March on Austin with colleagues Pio Renteria and Austin Mayor Steve Adler at the Texas State Capitol in January. That's according to a new survey out this week from NPR, the Robert Wood Johnson Foundation and the Harvard T.H. Chan School of Public Health. The survey found that 15 percent of Latinos say they've been discriminated against personally when trying to vote or participate in politics because they are Latino. Separately, 1 in 10 says that where he or she lives, other Latinos are "often" discriminated against in voting or politics. Compared with African-Americans, Latinos were slightly less likely to say that overall, there is discrimination against their own group in America today. However, those who did think discrimination against Latinos exists were more likely compared with African-Americans to say institutional discrimination is the bigger problem. Like younger African-Americans, though, younger Latinos were more likely to see institutional discrimination as a bigger problem compared with older people in their ethnic and racial group. Jaime Gonzalez, a college freshman in Texas, voted for the first time last year. At the time, a version of the state's strict photo ID law was in place. He says he ran through the state's strict voting rules and made sure he was ready before he got to the polls. "I just show them a government ID, like my driver's license, my ID — Texas ID," Gonzalez explains. Federal courts have ruled that the Texas voter ID law was designed to intentionally discriminate against minorities. That's because minority voters are statistically less likely to have the type of ID allowed at the polls under the law. Gonzalez said he found the state's voting laws frustrating. "It's unfair," he said. "That's it." Overall, Latinos say that discrimination based in government laws and policies is a big problem facing them today. "It makes sense considering where we are politically right now," says Victoria DeFrancesco-Soto, a professor at the LBJ School of Public Affairs at the University of Texas. "So essentially since Donald Trump launched his campaign he really put Latinos in the bulls-eye." DeFrancesco-Soto says when Trump kicked off his presidential campaign, he did it by targeting Mexicans. Trump has also promised a wall on the Southern border and said a judge could not treat him fairly because the judge was of Mexican descent. "But then you flip that," she continues, "and I think the silver lining to this is that you see Latinos in their urban areas — Latinos tend to be concentrated in metropolitan areas — that they feel positive about what their local officials are doing for them." And that's something the survey found, too. About 60 percent of Latinos say local government represents the views of people like them either "somewhat well" or "very well." Additionally, when asked, "How much can people like you affect what your local government does," 61 percent of Latinos say some or a great deal. Delia Garza, a city counselor in Austin, says in the first few weeks of the Trump administration there was a large spike in immigration raids in the area. "We included funding for immigrant services after all the ICE raids happened," Garza says. "I mean, that is directly helping our immigrant population. These are such great things we that we are able to do at the local level that could not have been done at the state level." Garza is the first Latina to sit on the Austin City Council. She represents a part of Austin that is almost 70 percent Latino. She says she thinks it helps that local officials in bigger cities tend to come from backgrounds similar to the people they represent. Three of the Austin City Council's 11 seats are currently held by Latinos. "Because when you represent a district like mine and you see working families that need a little help," Garza says, "it's important to have an elected official [who] represents them that understands that." Latinos in Austin say they feel that. Daniel Segura-Kelly, a local activist, says he feels like Latinos in Texas have a target on their back, but he feels better being in Austin. "We have a city council that is wildly supportive of our community," he says. "Our community can know that this is a safe place."